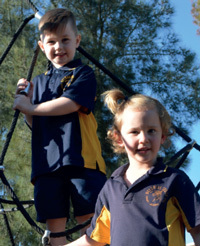 Beginning primary school is an exciting and engaging time for your child. The right start to school helps children build positive relationships and to develop a strong sense of identity and belonging, both of which are important to their long-term development, learning and wellbeing. Our school tours give you the opportunity to see learning in action and meet our Junior School Teaching Team. We visit classrooms across the school so that you can see the broad range of exciting learning programs and the many opportunities that are available to our students in Literacy, Numeracy, Science, Digital Technology/Multimedia, Creative Arts, Physical Education, Japanese, Environmental Education, Hospitality and Student Leadership. We look forward to meeting you for a school tour. We are excited to share with you how we challenge our students to be curious and aspirational learners. Enrolment packs are available at the office and at Len Jeffrey Memorial Preschool. Enrolment forms can also be download here Student_Enrolment_Form 2020. Once returned, Foundation 2020 T-Shirts will be given to your child in readiness for our 2020 Transition Program.